Blurb: Madeleine Tully lives in Cambridge, England, the World – a city of spires, Isaac Newton and Auntie’s Tea Shop. 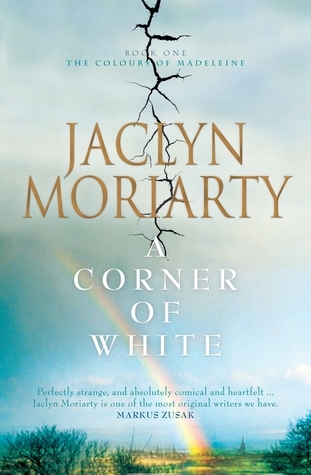 Review: ‘A Corner of White’ isn’t one of those YA books that is ever going to get the huge amount of hype surrounding it that others in the genre do. In fact, this isn’t one of those books that you’ll hear people discuss like ever. As sad as this is, it’s also the truth, that being said I personally think it deserves more recognition. Like I usually find in books, the blurb of the book doesn’t do justice to the level of awesome in this book. I honestly don’t think a reasonable length for a blurb could even begin to describe exactly what you’ll find in this book. The two main characters of this book are wonderful, if you’ve read reviews of mine before you’d know that usually I don’t have many issues with main characters, but in all honesty the main characters- Madeleine and Elliot, are truly up there with some of my favourites now. Madeleine is a very odd girl, in the first few chapters she reminded me a little of a Luna Lovegood sort of character, but with her own little odd habits and obsessions. At the beginning, Elliot seemed liked the perfect character but as the book went on, things started to be revealed about him that gave him some flaws-a definite positive in my eyes as I began to like him more. The supporting characters are also enjoyable, while I did prefer some over others, each of them had their own traits and things which either made me really like or not like them so much, either way I found them all interesting. The setting of the novel is split between two different worlds- Cambridge, England- ours and Madeleine’s world and Bonfire, Cello- Elliot’s mystical world. Throughout the novel, through Madeleine, we learn facts and little trivia’s about Cambridge, the people who once lived there or were connected to the town somehow and how all of this influences the lives of Madeleine and her friends. With absolutely no previous knowledge before going into this book, I learnt things about Isaac Newton, Lord Byron and Ada Lovelace through this book that I probably never would have taken the time to learn otherwise. Simultaneously, the fact of our world was being mixed with the fiction from the Kingdom of Cello. This world is amazing, exciting and completely different to our own. The details which were described through the letters between Madeleine and Elliot were interesting, and they made feel like some kind of successful scientist or something for understanding them. I know that this might put some people off this book, I hadn’t personally there to be so much detail about the science of it all and I had been worried as to whether I’d understand anything or whether everything would go right over my head (I admit to being much more of the English/History student that the Science one), but like I mentioned I did manage to understand it all and I did actually find it interesting. Despite the lack of hype that surrounds this book, I would definitely recommend everyone to give this book a try- I know it was much more than I was ever expecting.